Every chapters can be read on their own. No need for any previous knowledge about *Steem either. 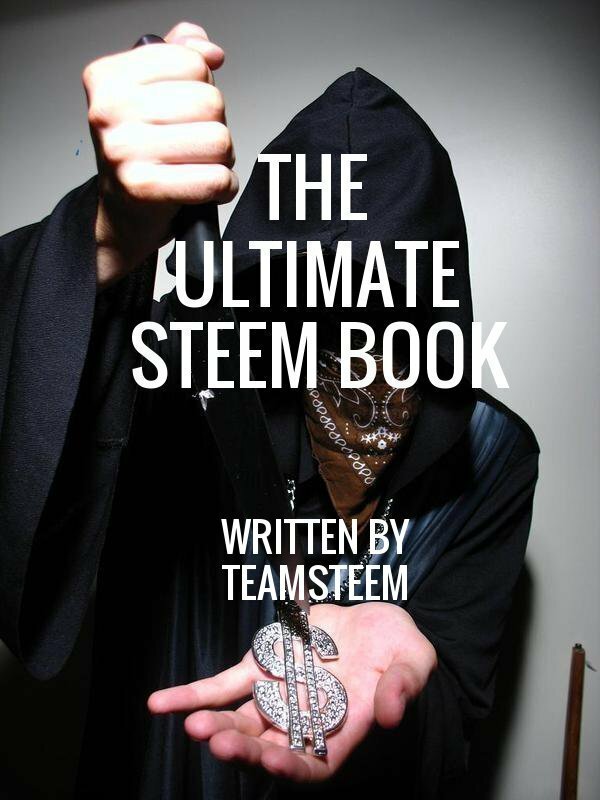 *Steem is a peer-to-peer open source cryptocurrency rewarding the dissemination of the most valuable information which is determined by stake weighted consensus. Posters and voters get paid with Steem, a currency and a sort of company share. Posts with the most shareholder’s votes rise to the top of Steemit.com or any other websites which use the Steem blockchain. Disclaimer: I’m not an employee of Steemit Inc. I do feel the need to mention this. Some people have made this error in the past. Chapter 7 - The Most Valuable Information Is Also The Most Influential! Chapter 8 - Joy Is What Steem Boils Down To! Money’s purpose is to facilitate the attainement of our most valued, our most sought out experience. Thus for money’s purpose to align with its creator’s most fundamental need, money must facilitate the attainment of bliss. The value of the different money are defined by their ability to provide us with our most sought out experience. When we’re in pressing need of food, “food money” has more value than” tools of self-defense money”. When we’re being attack the opposite is true. Anything of value can be argued to be money but I’ll broadly class all money into three different types and then try to simplify the fundamental place the different money occupies in our life and make better sense of them all. Commodity money is the first type. It has two forms, paper money backed by a commodity, i.e. gold receipts, silver receipts, food receipts etc. or the commodities themselves. The receipts can also be digital receipts and don’t have to be paper. The third type are cryptocurrencies. This is a new type of money created for the first time in 2008 and which I’ll be talking about more in depth down below. Most creators or issuers of fiat currencies are nations or states. Fiat currencies benefit or empower the nations which issue them. Fiat currencies empower nations and not necessarily the individuals of those nations as the money issuers by definition are the ones who decide of the beneficiaries of all newly issued dollars or yuan or rubles or whatever currency is created. Not knowing the process by which newly issued fiat currencies are distributed is problematic. Saying somewhere someone knows what is the process of money creation and this process must be fair or if it wasn’t then the persons in the know would speak up for us is also problematic and fallacious. "And that is exactly and precisely what the belief in "authority" is: the insane notion that it can be good to NOT use your own brain and heart to figure out how to behave, but to instead blindly defer to someone or something else. And you don’t have to look far (any history book will do) to see the real-world results of that belief. " "In summary, the only effect the belief in "authority" has on BAD people is to give them a means by which they can drastically increase their ability to victimize good people, and the only effect it has on GOOD people is to make them passively submit to injustice and cooperate with evil. " "In other words, the belief in "authority" always endangers the good and empowers the evil. " If we were a farmer at a farmer’s market and a buyer would show up and ask us the cost of buying everything we have to sell and upon hearing our answer would take out a printing press and would begin printing all the money needed to buy all we have, we’d surely begin to ask questions. We’d question how does it make any sense that we worked so hard to sow, grow and harvest everything we have just to have someone show up and buy everything by printing a couple of milliliters of ink on some papers or better yet adding some numbers on a screen. We would have good reasons to question the fairness of the process. This holds true even if its happening on a larger scale. Presuming somewhere someone knows the process of money creation is fair and thus justify us not looking deeper into it is fundamentally flawed. The two quotes above and the video below prove this way of thinking whatever the subject is always disempower those who are ignorant at the expanse of those in the know. In a future chapter I’ll present the best sources I know for anyone interesting in investigating those who own the money creation systems and how they use those systems to gain advantage over everyone else. Upon entering a country lead by a dictator if we were asked to exchange our US Dollars for the dictator’s money knowing full well that this would allow the dictator to more easily buy weapons which they would be using to expand their influence and oppression we’d be very warry of doing such a thing even if we were proposed whatever extra special exchange rate for our US Dollars. The words and stories we tell ourselves and our life experiences give money its value. Those are influence by the reality we live in, our needs and life’s aspirations. Ultimately money’s purpose and how good we perceive it fulfill its purpose is what give money its value. Fiat currencies national currencies are tools created by nations. Their purpose is to empower the nations that created them. Fiat currencies are an important part of the tools use as a leverage in the different power struggle between nations as well as between the individuals of the same nation. Fiat currencies as they are use right now aren’t empowering individuals but on the contrary, they are used to empower the nation at the expanse of its population. Let’s not forget, the more of a currency is being issued the more devaluation it will incur but as the second quote of this chapter illustrate this isn’t a problem for the issuers. It’s only an inevitable result of their scheme. Fiat currencies aren’t necessarily bad for the individuals but will always have a tendency to get corrupted by the most tyrannical. Nonetheless, it is how fiat currencies are used, created and to whom they are distributed that makes them bad or good. Cryptocurrencies are created by a process control by individuals. Their issuance systems are decentralized and tamper proof which give cryptocurrencies a fundamental advantage over fiat currencies. Cryptocurrencies empower individuals compare to fiat currencies which tends to empowers states or the most tyrannical people of a group. To prove cryptocurrencies superiority over fiat currencies I state three main functions of money and detail some of the advantages cryptocurrencies have over other type of money to fulfill those functions. Money’s primary function is to influence our world to create bliss. All other money’s functions importance are determined by how helpful they are in fulfilling money ability to create bliss. I’ll begin by discussing Bitcoin and end by expressing what I see as some of the functions Steem can do better than Bitcoin or which Bitcoin simply can’t fulfill. Cryptocurrencies and thus Bitcoin doesn’t have to be perfect to be adopted or preferred over other currencies. They only have to be better than the next best currency. Bitcoin are priced in fiat currency. Thus both Bitcoin and fiat currencies can equally be used to influence our world to our liking. Then what makes one from better the other is how good they are at storing wealth. Bitcoin price have gone up more than 100,000% in less than 6 years which have made it 1,000 times better at storing wealth. Here’s an attempt to explain why. First, the lower transaction fees of Bitcoin compare to fiat currencies are an incentive to buy Bitcoin if and only if Bitcoin is a good store of wealth. Bitcoin miners continue mining as long as they can sell the Bitcoins they mined at a profit. If the costs of mining a Bitcoin are rising then miner must sell Bitcoin at an ever rising price. This benefit everyone. The Bitcoin holders and miners are benefiting from the rising prices and everyone is benefiting from Bitcoin lower transaction fees compare to fiat currency transaction fees. I want to highlight that everyone is incentivized to mine Bitcoins. This is an over simplification and almost nobody should invest in mining Bitcoin unless one is ready to invest a large sum of money for large scale mining operation. Nonetheless, this incentivization leads to an ever growing competition in Bitcoin mining as stated above and a favorable situation for all. When cryptocurrencies price rise they gain power or influence over fiat currencies. For the reasons above it is easy to see why Bitcoin empower the early adopters over the late comers. Already more than 78% of all Bitcoins that will ever be created have been created and the rest will be mined in the next 123 years or so. Steem has many advantages over Bitcoin. One of which is newly created Steem are awarded to those who’s create the most bliss or the most valued experience according to stake weighted votes. This is one very interesting advantage Steem’s has over Bitcoin and one of its biggest. Steem doesn’t have transaction fees. Steem can do ridiculously more transactions per seconds than Bitcoin currently can and Steem already has some solutions to push its transactions limit even much higher. Steem has 3 seconds transactions time compare to 10 minutes for Bitcoin. Steem has many function which Bitcoin doesn’t have. Steem incentivize, reward and disseminate the most valued information. This information can’t be censored. Steem is so vast and its future repercussions seem so profound, it quickly become tricky to foresee. Steem and Steemit.com documentations and developments are already very impressive and new lines of codes are being written daily signs of a promising and healthy growth. Also, there are some of us who would prefer not to use money that empowers certain dictators, empires, systems, companies etc. and for that reason have begun to invest in Bitcoin and cryptocurrencies. They are some people and I’m one of them who made the choice to invest in Steem for the reasons mention above and because we perceive Steem as being more in line with our most cherished ambitions. Disclaimer: These aren’t investment advices to follow blindly. Today’s cryptocurrencies market cap is just shy of 17 billion which rank them around the 285th biggest market cap of the S&P 500. For all the reasons I’ve stated above, throughout my book and also everything I know about cryptocurrencies but I haven’t shared yet, I have invested quite a large part of my holding in them. It is my understanding that the risks/benefits make it so that every millionaire if they would understand those risks/benefits of cryptocurrencies that it would make sense for them to invest from tens of thousands of dollars to millions of dollars into Bitcoin and from tens of thousands to hundreds of thousands into Steem. Many people have already invested up a hundred of thousands of dollars into Steem. They are risks but to my understanding investing in the occurring as well as the potential shift of influence from fiat currencies to cryptocurrencies far out way the risks that not investing represent. If true this will become more apparent as time pass. Also, it might not make much sense for a rich person to take the time to create content for Steem right now as their time might worth more than the potential post rewards and this is in direct favor of the least wealthy. Yay! My witness node is running without any problems and I haven’t missed a block since the last fork. I’m keeping track as much as possible to everything related to witnesses. I didn’t update my price feed in the last month. Only the top 19 witness price feed is taken into account to calculate the price feed so at this point this isn’t a priority for me. Thank you to everyone who is supporting my witness. I received 4 more approval for my witness since the last time I posted. The 4 votes come from 4 other witnesses which I have been approving. I received vote in that order from @good-karma (esteem app), @chitty, @furion (Steem dev) and then @ekitcho CEO of busy.org. I invite you to check them up. I haven’t posted the French translation of the introduction as I said I would do. I had my mind occupied elsewhere but I will post it in due time. I’ve continued to read more than 100 Steem articles a week possibly 200. I have read the latest hardfork proposal. (v0.17) I happy with the many proposal but have some very real reservations on the proposal to have a separate pool for comments. I’ve stated some of my reservations on the Steem GitHub and will continue to share my thoughts on the proposals. I’m very happy to see the proposal of removing mining. I have stated in a previous chapter I would have wanted to see it disappear in the previous hardfork so I consider this proposal very a very good news. I look forward to better collaborate with everyone on this platform, not only those who actively support me. Together let’s make Steem better! And let’s not forget it will always make more sense to win one another over than to win over one another. There’s so much more I want to share! Here’s my song of the moment. It’s one very poignant song. It has a little 1 minute intro which is followed by the studio version of the song. I’ll be releasing chapter X with multiple sub-chapter here on this post. I’ll work on this throughout this month. The chapter will be encrypted and the keys to each individual sub-chapters will be release when I feel like it. (I might never release the keys.) It will be about some future projects I would love to see or I’ll be working on, some predictions and some observations. I might repost this chapter in a comment below and not edit it to more easily prove when it was posted. You are getting borring... You publish only excellent stuff ! Hahaha! You made my heart skip a beat for one second! Hahaha! Thanks Dan! That is one of the most fun comment I had. It would be nice if you comeback to comment a little something, even if you just read part of the book. Either way, enjoy! It feels good to read your comment. I look forward to translate every chapters as much as possible. We'll see. Good post sir. I enjoyed it. Good advices, Some funny videos in there too. I'm super glad you like it @klye and had a good laugh. I agree. The more people agree on something the more value or influence those agreements will tend to have. Very nice post, especially the last part on bitcoin, steem and mining. Note a typo in your table of content (chap8). I'm glad you love that part. I was wondering how much value it would have for people. Awesome. I'm so glad when people take the time to comment and even more so when they resteem and mention it. I have so much left I would love to share. Thank you for all of the information. I'm new here, so it's nice to have these informative guide books. Yes! Your comment is great. I'm glad to see my book can help people better understand crypto and Steem in particular. Wow that is a mega post! Thank you for reading and tweeting it. I really appreciate it.